"Bring me back a shell," said my mother over the phone when she heard I was spending a long weekend on Sanibel/Captiva Island in Florida. My mother loves small objects that she can display on her windowsill or on her wooden bookshelf crammed with cookbooks dating back to the seventies: everything from The Frugal Gourmet to Jacques Pepin. I don't think she consults her cookbooks much, but she likes seeing all their spines. The shoreline where I found the whelk (pictured above) was located not far from the toll booth leading onto Sanibel Island. We were there for a friend's lavish, multi-day wedding, but they weren't expecting us until 6 when we'd share drinks at a popular Captiva bar and grill. I was overdressed from our flight out of a snowy Logan Airport, and the wind was whipping my silver scarf and strands of my hair into my eyes as I walked slowly along the shore, looking down for gifts from the sea. Mike and I later learned that some of the shells we found (including the whelk) weren't without their original occupants. At the Bailey-Matthews Seashell Museum we watched a short film about the life of mollusks (yes, we really did). To say the film was an amateur production would be paying it a compliment--it was more like the home movie your high school biology teacher might have filmed over winter break. But the shells we saw on our walks were so varied and pretty that finding out their names and where they came from seemed the respectful thing to do, especially if I was going to be carrying pocketfuls of them home to Boston. We learned the difference between a gastropod and a bivalve, that the lower portion of the mollusk's body typically forms a muscular foot, which is used for creeping or burrowing in the sand. I recalled that my lightning whelk still had it's black foot peeking out (when I tried to pull what I thought was the dead creature out, it stuck like it was glued in). I realized that I might have plucked a live organism from its natural habitat. Not only was that inconsiderate to the poor gastropod, but it was also illegal in Sanibel. Oops. My authorized finds included an atlantic kitten paw; a broad-ribbed carditid that resembled the sort of fan ladies in polite society used to carry; a purplish calico scallop with what looked like small parasitic mouths covering it; and, my favorites, a few small and white spiny jewelboxes. I'm not the type who can rattle off the scientific names of flowers or trees or birds (I'm reading a novel right now that features a scrappy young heroine who seems to have committed every volume of Handbook of The Birds of the World by heart--she rattles off their names to anyone within earshot). I'd like to be more informed, know the proper names of things, what each thing does, and where it comes from. I'd like to have names for all the objects of the world, as if by having their name I can come to know them. Thank you to Noetic Books/New Harbinger Publications for the review copy. On the back cover of this New York Times Bestseller is the question "who are you really?" Before I read this book, I would have answered, "I am my thoughts, opinions, actions, experiences, and memories" or "I am a 39-year old wife, daughter, aunt, and friend." 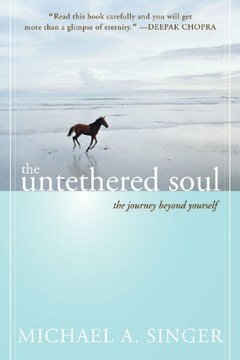 After reading The Untethered Soul: The Journey Beyond Yourself I realize that the answer is more philosophical and complex than all that. Basically who I am and who you are exists in the seat of our consciousness. We are the person who observes our thoughts, emotions, actions. Why is this distinction of self important? Because, according to author Michael A. Singer, "you not only have the ability to find yourself, you have the ability to free yourself." I'm attracted to books on mindfulness because in the last few years I've realized that, like so many people, I'm in danger of losing myself in my thoughts. It occurred to me that I was missing most of my life because my inner thoughts were loud and ceaseless, like some annoying passenger on a five-hour train ride who decides to pass the time by calling everyone she has ever known on her cell phone (which is why I try to get a seat in the Quiet Car as often as possible). I want to put these inner thoughts on mute so I don't miss the experience of being alive. The Untethered Soul struck a chord in me because it encourages detachment from this never-ending feedback inside our brains. "The best way to free yourself from this incessant chatter is to step back and view it objectively," Singer writes. "There is nothing more important to true growth than realizing that you are not the voice of the mind--you are the one who hears it." If you watch it objectively, you will come to see that much of what the voice says is meaningless. The truth is that most of life will unfold in accordance with forces far outside your control, regardless of what your mind says about it. In fact, your thoughts have far less impact on this world than you would like to think. Eventually you will see that the real cause of problems is not life itself. It's the commotion the mind makes about life that really causes problems. The idea that we are not our thoughts is sometimes a difficult concept to get one's head around. But if you can understand this you are poised to enjoy your life much more than you ever could when you were viewing life through the filter of your inner thoughts and perceptions. I did take issue with some of the sweeping proclamations in the book, such as "Once you reach this state [of letting go] you will never have to worry about anything ever again." That may be true, but if it is human to suffer, then are we really meant to transcend all our worries all the time? Wouldn't that make us more like automatons than real people? But then even the concept of Death is given a positive spin in the book. If it were not for Death, Singer reasons, we would not appreciate our life and the lives of others. If you thought that this week was your last week on Earth (or the last time you would talk to your mother or best friend), wouldn't you want to enjoy it (and reach out to that loved one?) If Death did not exist we would squander our time because there would be no end of it. So in this regard Death -- or our knowledge of it coming at any time -- becomes a gift. Overall I responded to Singer's words and how he is able to boil life down to one choice: do you want to be happy or do you not want to be happy? I don't think he's asking readers to wholly discard our difficult thoughts, emotions, and experiences. Instead he encourages us to transcend them, to see that who we are is in fact larger than all that. Depending on your religious beliefs, we are all existing on this constantly-changing, spinning Earth for a short time. Do you want to give up your one chance to fully appreciate the ride? The Untethered Soul was not a quick read for me because there were many ideas I wanted to digest slowly. Like with life I wanted to pay close attention to this book. Recommended for anyone interested in books on happiness and/or personal/spiritual growth. Back in the spring I bought a little starter kit for an Italian herb window box at Barnes & Noble. I never planted anything from seed before and all of my colleagues' talk of gardening had inspired me to take a baby step toward growing my own. I live in an apartment so I had to keep it small anyway. Italian herbs seemed a good way to get my hands dirty. I didn't actually get around to starting my kit until August, which may have been my first mistake. The process was simple enough--you placed the clay pellets on the bottom of the container, soaked the eco-coir disks in water, then spread the resulting soil over the pellets. In this small way you had the opportunity to get your fingers knuckle-deep into soil, and the experience was both messy and primal. I finally had soil beneath my fingernails. The next step was to sprinkle the tiny seeds each in their own section (sections were marked off with pencil on the side of the container) and cover the whole container with plastic wrap to speed up the germination. My second mistake was leaving the plastic wrap on a little too long. Sometimes I have a tendency of wandering away and forgetting things, and in this case, I didn't expect the germination to happen so fast. It was exciting to see those first green shoots--each one the size of an ant. I was supposed to put the container somewhere sunny. Unfortunately our apartment is as dark as a cave. Our livingroom has two windows and though we don't have any window treatment on them, they still don't shine much natural light into our cellar-like dwelling. The sunniest room is our office so I placed the container on the windowsill that seemed to attract the most sun. For a while there was noticeable progress. The parsley growth were still as tiny as fleas but the oregano and basil were shooting up above the lip of the metal container. Of course, I was anticipating the lush herbs I would be using in my tomato sauce by the end of the week, but my husband said to be patient--it would take more time. Patience is not my virtue; in fact I have only a fleeting acquaintance with it. But I mentally calculated that my herbs would be ready by September. In October my husband suggested I harvest some of my stubborn little shoots to make room for them to grow exponentially. They were too small to use but I needed to allow more room in what was becoming an overcrowded tenement. Although I was pissed off that my shoots were stunted, they were still my little seedlings. How could I choose which ones to kill and which ones to spare? I had my own version of Sophie's Choice here, and I didn't want to cut any of them off from a potentially viable life as an additive in my marinara sauce. But I hadn't come this far just to chicken out--if you wanted to live off the land, I reminded myself, you had to be willing to make the tough sacrifices. So I plucked about six shoots from the box. I cradled them in a soft tissue and laid them to rest in my wastebasket. One of my cats fished the wadded tissue out of the trash and spread dead seedlings all over my floor, leaving a trail of soil behind her. Even at the last moment, these aborted herbs were denied a dignified burial. After the brutal harvesting my herbs just stopped growing. I watered them and turned the box around so both sides could receive benefit of direct sunlight. Each time I went to check on them, my herbs remained dwarfed and barely fragrant. That's when I got angry at my herbs. I had given them my tender loving care and attention, but they refused to thrive. They seemed another example of the failed potential I saw in my own life. I still hadn't written that novel. I hadn't traveled to the Amalfi Coast. I hadn't been profiled in O magazine wearing a gown of jewel hues. I was almost 40 and I couldn't even grow three simple herb plants. I remember the last time I was unemployed, which was only for a month. Still, my husband and I were both unemployed at the same time, and this seemed a bad omen. But I didn't know from bad omens until some goldfish we had rescued from a wedding where they had been centerpieces all died in the same week. I woke up one morning and found two of them had jumped from their bowls onto the place mats on our kitchen table. We are doomed, I thought. I did get a job pretty quickly after that and Mike did, too. So maybe my superstitions were unfounded. Still, I would like to see at least a couple of bunches of basil flourish.